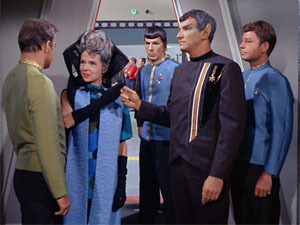 This entry was posted on Thursday, 3 February, 2011 at 22:09	and is filed under Star Trek. You can follow any responses to this entry through the RSS 2.0 feed. You can skip to the end and leave a response. Pinging is currently not allowed. This is one of my favourite episodes in the series, like you, i found it to be one of the stronger ones with a really good plot but i think one of the other things that made me love it is just how it ends, with them all in Sick Bay talking and McCoy getting them to be quiet and then looking around a smile on his face and says “Well what do you know, i finally got the last word.” I just found it really amusing because it always seemed in the other episodes that McCoy always seemed to get tripped up in the ending discussion or someone else would steal his line out from under him and become the focus of the attention and i just liked how even he acknowledges it with that simple line.